The biggest thing about iOS 8 for me is a productivity boost stemming from new technologies such as pervasive inter-app communications, third-party actions in system-wide Share sheets and more. But for all the good work Apple’s done from a productivity standpoint, iOS (version 9 included) still has some way to go before it’s capable to exceed multitasking features on Microsoft’s Surface tablets or Samsung’s Note phablet, for example. 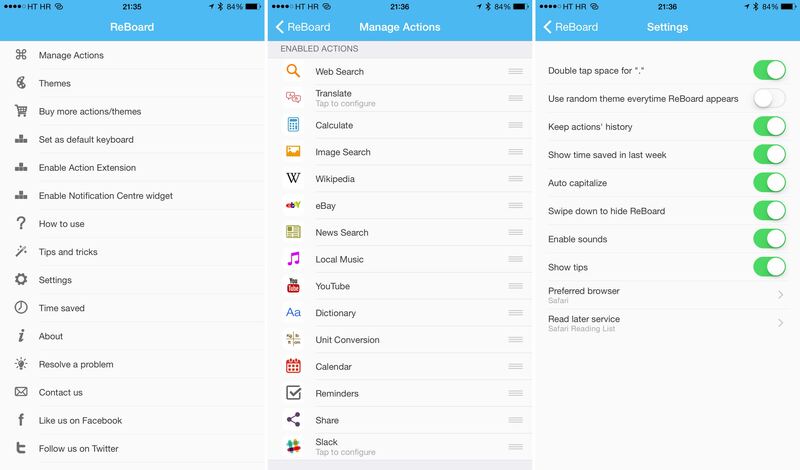 ReBoard, a new software keyboard for the iPhone, iPod touch and iPad created by India’s independent developer Gursimranjeet Singh, puts useful actions for performing common tasks and all sorts of look ups right into the keyboard itself so you won’t need to switch back and forth between apps like an animal. By embedding useful third-party shortcuts within the context of the keyboard, ReBoard can save you a lot of time and boost your productivity. All told, the initial release of ReBoard offers eighteen powerful actions. Multitasking features are enabled upon hitting a dedicated Command (⌘) key, which can be located next to the keyboard’s predictive section. Doing so reveals a panel with scrollable icons representing available actions. Tap an icon and whatever you typed after the Command symbol gets passed to that action. Say you’re chatting with a friend in WhatsApp and you want to send them a YouTube video link for the new iPhone 6s commercial featuring Apple Pay. Such a seemingly simple task normally involves a multi-step procedure requiring you to switch to the YouTube app, tap the magnifying glass icon to search for a specific video, copy the link, switch back to WhatsApp and paste the URL into the chat. Or, I can tap ReBoard’s Command key in WhatsApp, type in ‘iphone apple pay ad’ and hit the YouTube icon. Video thumbnails matching my selected query appear which I can scroll through right within the keyboard. Now I just tap on the Apple ad thumbnail, choose Insert Link in an overlay that appears and that’s it—I just shared the ad with Seb without ever leaving WhatsApp. Now imagine I’m idly chatting with Sebastien over iMessage and want to shoot him a song that I really like. Again, tap the Command key, type in a song name and hit the Music action. Upon scanning my available on-device music, including songs from Apple Music that I have added to my collection, ReBoard presents the matches. Tap a song I want to share, choose Insert iTunes Link and boom—the iTunes Store URL gets pasted right into Messages. 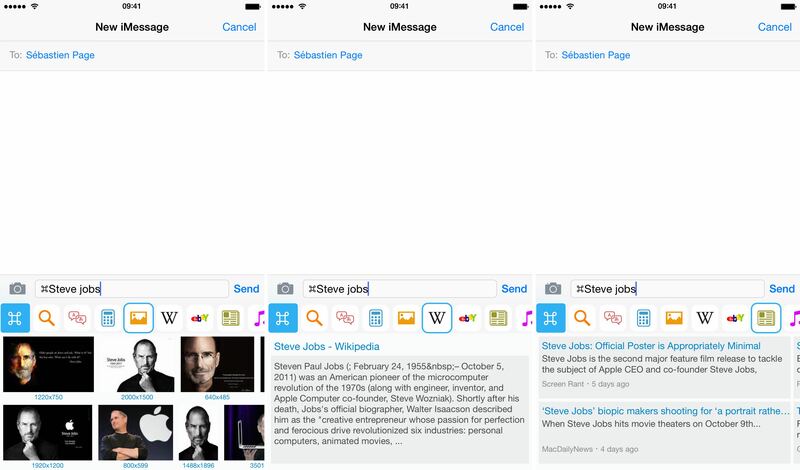 The screenshots above depict searching Wikipedia (at left), eBay (in the middle) and Google News (at right) for the term ‘Steve Jobs.’ You can also perform simple calculations within Reboard, similar to Spotlight on El Capitan. Another example: how do you schedule a calendar appointment in WhatsApp? 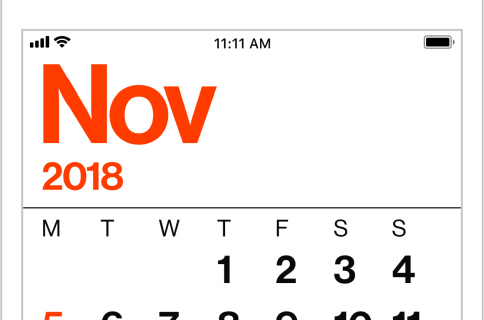 You would normally switch to Apple’s Calendar app, right? 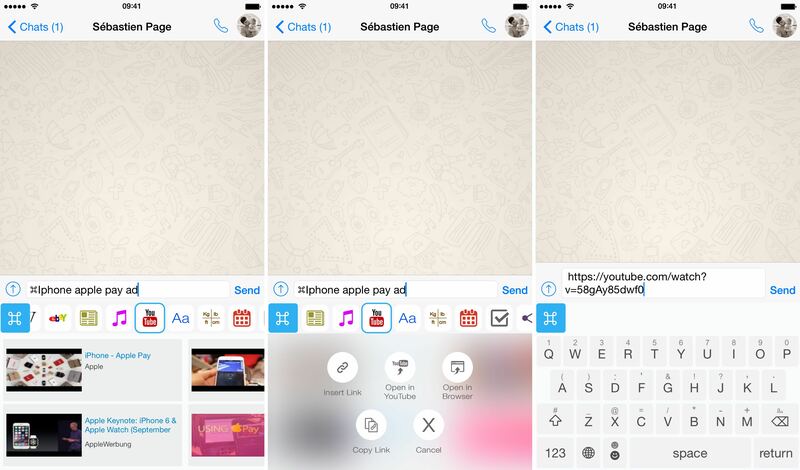 With ReBoard, creating appointments is possible within the keyboard using natural language processing. I just tap on the Command key and type something like “Design meeting tomorrow 4pm,” “House party next Saturday” or “Call Sebastien in 2hrs” and ReBoard creates an appointment for me in one fell swoop. 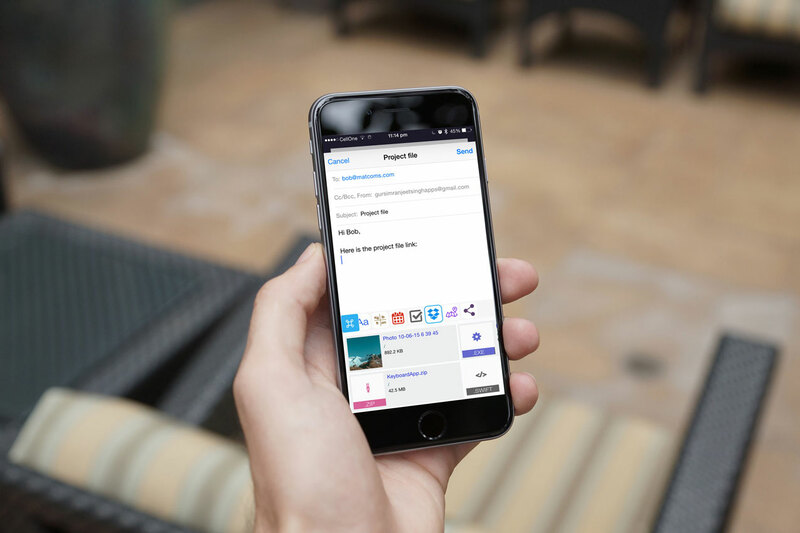 Nearly every action includes additional things you can do with the results, like copying a link, downloading an image, inserting a link into the currently selected app and much more. Connecting ReBoard with Dropbox will allow you to search your Dropbox files and share files’ links with others directly from within the keyboard. Images can be searched on the web, but also saved to the Camera Roll and shared with friends. The Slack action lets me search and post messages to our group on Slack without having to dive out to Safari or actually open up the Slack mobile app. 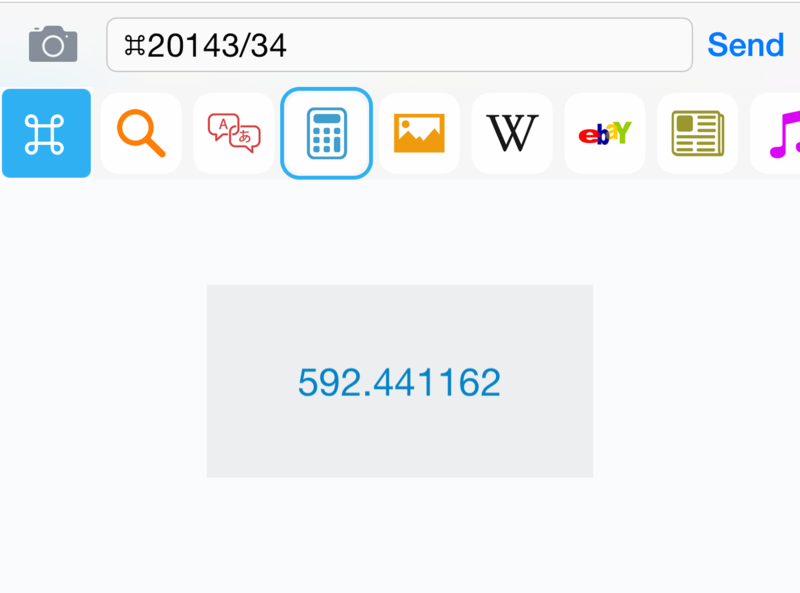 It’s also possible to search local places on a map, view and share their addresses, call them directly, view their maps within the keyboard or open the location in Google Maps for iPhone and iPad. And because ReBoard is a system-wide keyboard, the aforementioned productivity perks are always available in any app within the keyboard context. 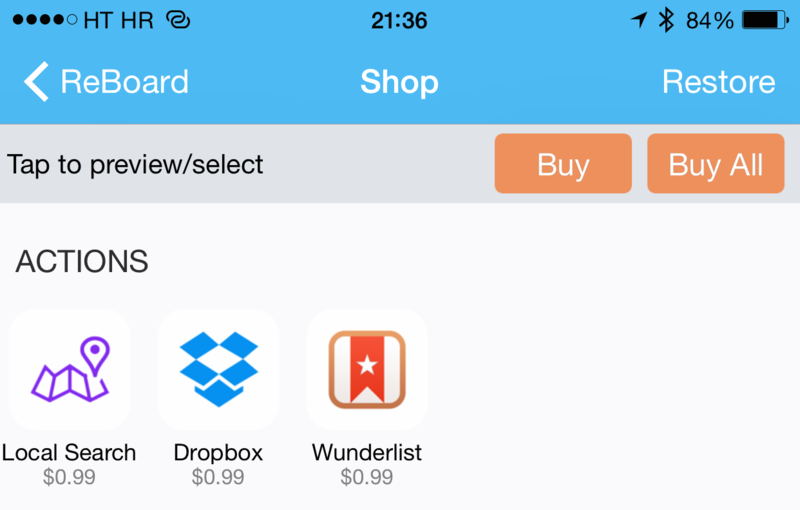 Keep in mind that Dropbox, Local Search and Wunderlist actions are locked behind a 99-cent In-App Purchase each. ReBoard includes a cool set of features designed to enhance your typing experience. 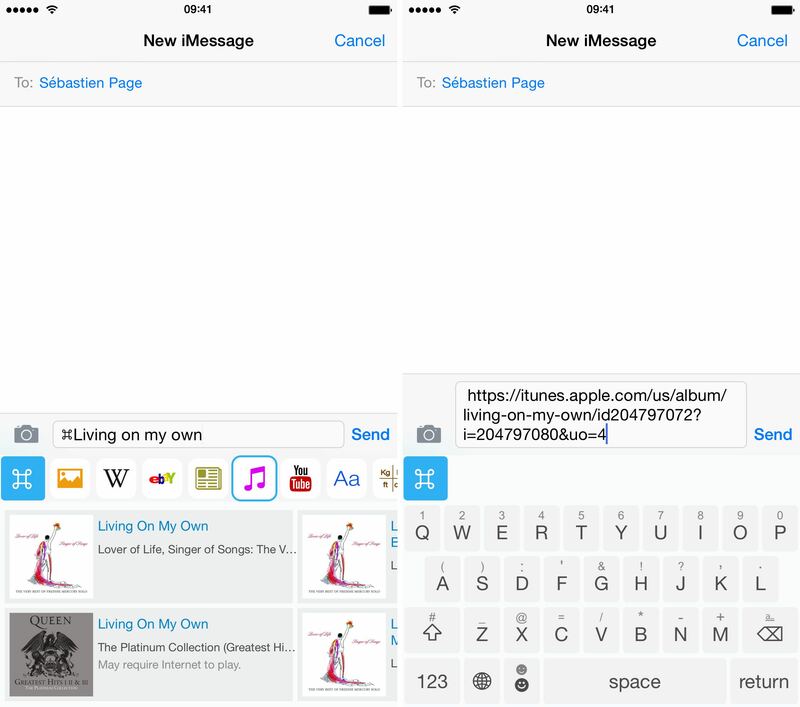 For starters, the keyboard includes full landscape support and typing suggestions. For instance, typing “complete” will offer variations like “completion,” “completed,” ”completing” and more. 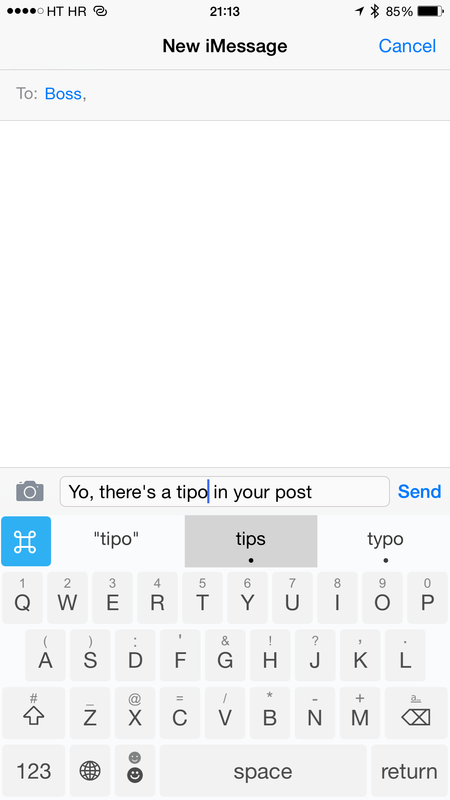 And should you see a dot below a suggested word, tap it to reveal variations. Sadly, ReBoard cannot tie into iOS’s stock dictionary due to Apple’s rules. To disable predictions, just long press the Command key until a “Typing suggestions disabled” message flashes briefly. To be fair, predictive text entry feels like it could use more work though your mileage will vary. All things considered, typing on this keyboard feels very natural: I was able to achieve my standard typing speed after just a few minutes, which cannot be said for countless other iOS keyboards which leave a lot to be desired in terms of actual typing. 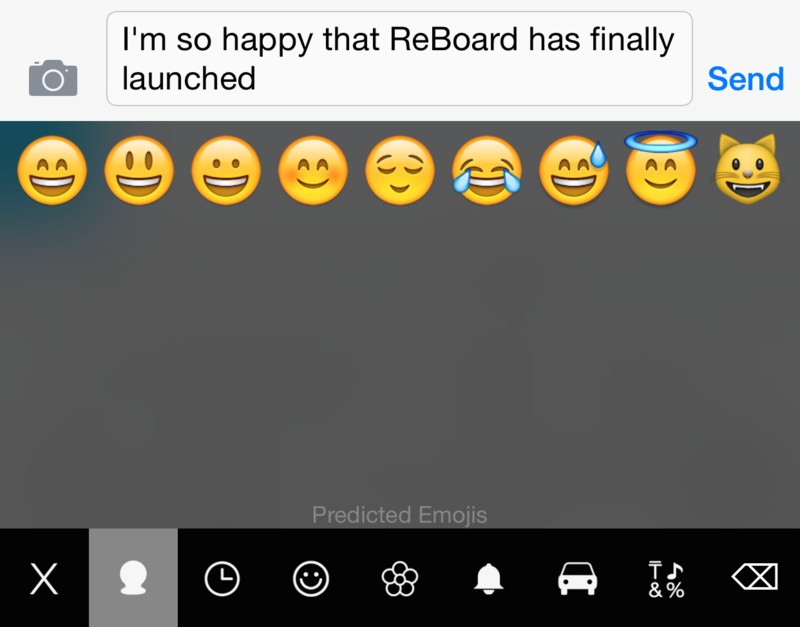 ReBoard also does predictive emoji. Speaking of which, you don’t even need to search for the right emoji. 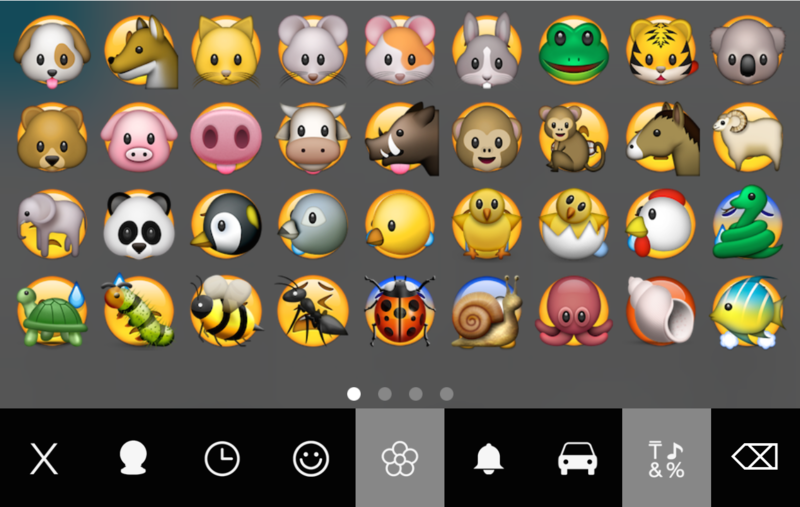 Just type your message, open the emoji panel and ReBoard will show you the most relevant emojis to what you just typed. To type a quick smiley, just swipe up on the emoji key. To make you even more productive, ReBoard employs gestures. For starters, you can delete a word with a quick swipe upwards on the Backspace key. If you tap-and-move your finger across the Spacebar key, you can position the cursor which can be quite handy when selecting a block of text. Using the Spacebar key like a trackpad for scrolling through text and positioning the cursor works great and is reminiscent of Apple’s improved QuickType keyboard on iOS 9 which allows you to use the entire keyboard as a virtual trackpad of sorts. To access numbers and punctuations, you can 1) go the old-fashion route and tap the Shift key, or B) swipe up on alphabetic keys. Lastly, swipe down anywhere on the keyboard to close it or swipe up on any other key to access its alternative character. 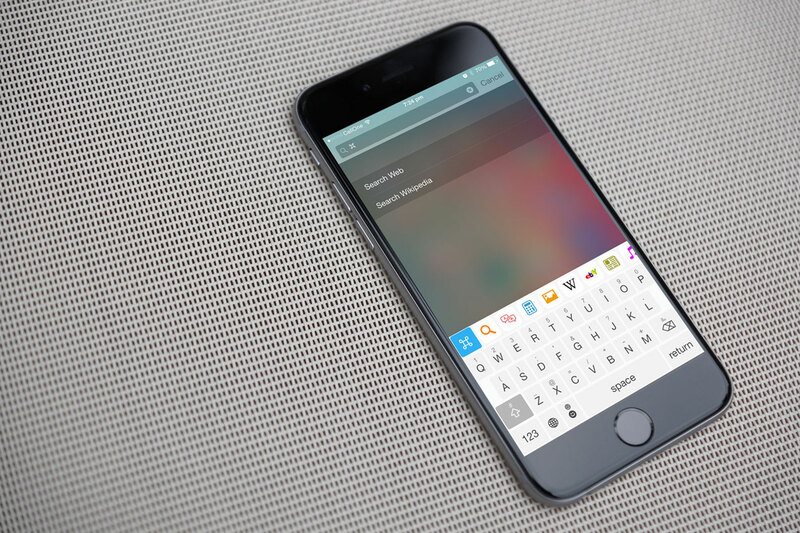 What would a great iOS keyboard be without themes? ReBoard supports theming so you will be able to soup up your keyboard with nearly a dozen themes. The app makes things even more interesting by loading a random theme every time the keyboard appears, should you choose so. Unfortunately, only one theme is included for free as eleven others are sold through the In-App Purchase mechanism, priced at 99 cents each. I have noticed a few annoyances with the initial release of ReBoard. The biggest issue is how the keyboard behaves when using actions. At best, it’s fiddly to use: you must press the Command key before typing a search query. If you just tap the Command key and hit an action without typing anything, the app will paste whatever text was on your clipboard as the action’s input. Likewise, should you input a query before tapping the Command key, ReBoard enters the last thing on your clipboard. This is by design but developers tell me ReBoard’s next update won’t default to using clipboard text as input so there shouldn’t be any confusion. Truth be told, the inaugural edition of ReBoard has this switch present within its shell app (the ‘Keep actions history’ option) but it’s disabled by default. Lastly, the initial release of ReBoard supports only English language for predictive input, but developers tell me that more languages are coming by way of future updates. I chatted with developers about what fixes and new features might be expected from ReBoard’s forthcoming update. Turns out they had already submitted an update to Apple which improves ReBoard experience on many fronts. Using clipboard text as input will be disabled by default. Auto-capitalization is improved a lot and works much better now. Keyboard responsiveness is much improved and faster. Bug fixes: ReBoard will work much better now in every corner of the app. Guided tour explains more clearly how to use the Command key. They team is even mulling selling custom actions and workflows to enterprise users. When the developer initially approached me regarding reviewing ReBoard, I must admit I was a bit skeptical. Having tried dozens and dozens keyboards for iOS 8, I’ve come to realize that many of them are poorly designed, not very functional or just frustratingly slow to use. But not ReBoard. 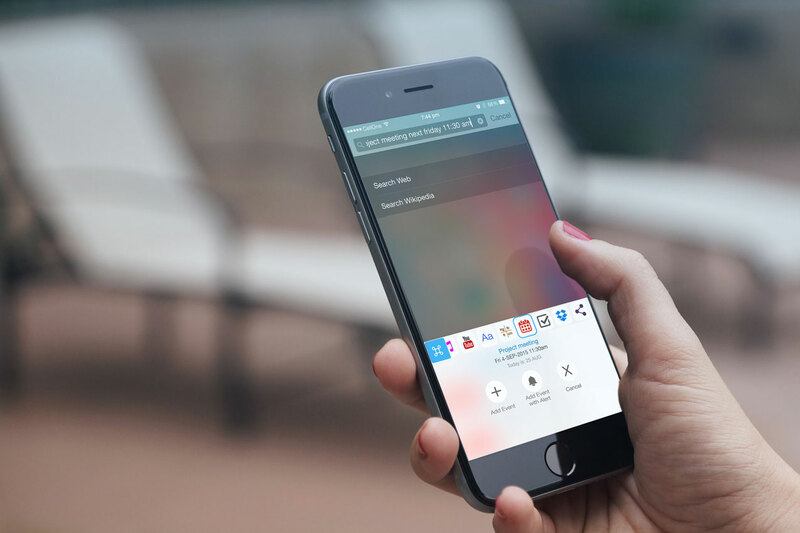 While the aesthetics of the app could, and will be improved, and text entry made more responsive, the app’s focus on providing quick actions to get more stuff done is what really makes ReBoard stand out from the crowd. Once you get past the initial quirks and get the hang of it, ReBoard will save you tons of time. After using ReBoard for a couple days, I couldn’t bring myself to go back to double-tapping the Home button and sliding between apps. ReBoard’s miniature app-like functions are guaranteed to accomplish common tasks in fraction of the time it takes to use multiple apps. ReBoard is a great time saver and I couldn’t recommend it more. ReBoard supports any iPhone, iPod touch or iPad model with iOS 8.1 or later. The app is fully optimized for native display resolution of the iPhone 5/5s/5c, iPhone 6 and iPhone 6 Plus. 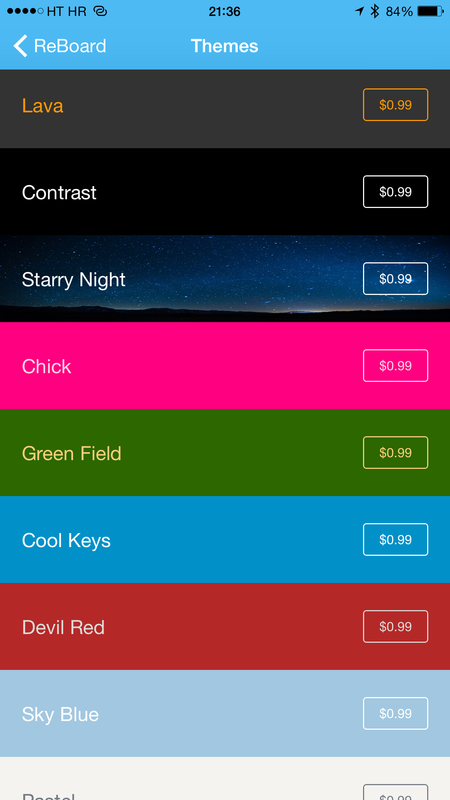 As mentioned, additional themes and some actions require an In-App Purchase though most people will be pleased with actions available out of the box. ReBoard, a 23.3-megabyte download, is $1.99 in the App Store.